ISKCON has 40 temples in India and these temples are dedicated to Lord Krishna. An ISKCON temple is located in the Juhu area of Mumbai and it is dedicated to Lord Krishna. Sri Sri Radha Rasabihari ji Temple is the official name of this temple and it is also known as a Hare Krishna temple. Visiting temples are a good way to feel divine from the hustle bustle of daily life in a peaceful environment. It houses the deity of Lord Krishna and Radha. It is one of the most beautiful and visited the temple of Mumbai area and it’s visited by thousand of devotees everyday. Temple complex houses seven storey twin towered guest house, restaurant, gift shop, sweet shop, book shop, library, etc. It is located on Hare Krishna Land in Juhu area of Mumbai. Srila Prabhupada was the creator of the ISKCON temple Juhu and it was built in 1978. It is a very spacious temple built on an area of around 4 acres. It is located in Juhu area and it is very near to the beach. Juhu area is well connected to the Mumbai and reaching here is a simple task by various modes of transport like auto, bus, taxi, metro and local train. It is a 10 minute walk away from the beach. Vile Parle railway station of Mumbai is the nearest local railway station which is around 2.5 KM from here. Devotees can reach here via the Mumbai Metro, Andheri metro station is the nearest metro station, which is around 3 KM from here. Iskcon temple is visited by thousand daily along with locals and tourists as well, therefore, knowing temple timings and schedule in advance will surely save lots of time and help to prepare an itinerary accordingly. 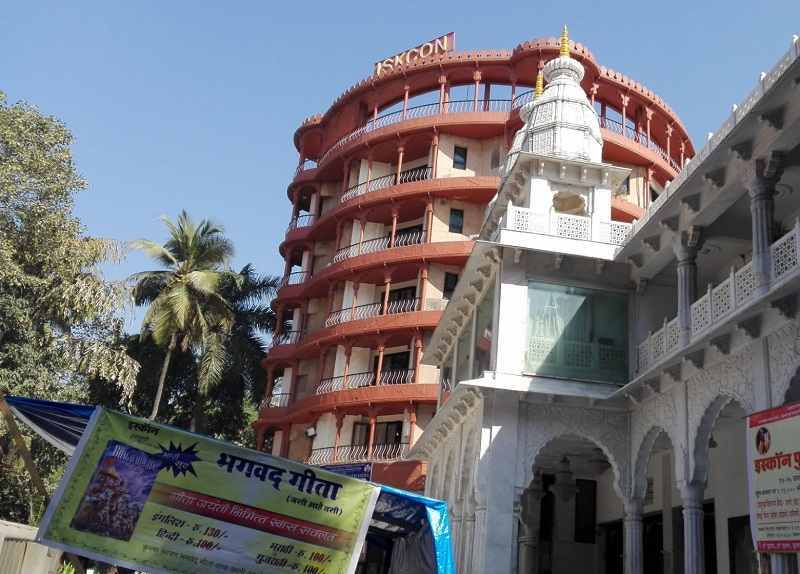 Iskcon temple Mumbai strong>opening time is 4.30/strong> in the morning with Mangala arati and multiple programs and arts are performed throughout the day as per the schedule. strong>Iskcon Mandir closes at 9 PM/strong> after the sauna arati. It remains closed from 9 PM to 4.30 AM on the next day. In the after noon temple remains closed from 01:00 PM to 04:30 PM. Full schedule and aarti timings of Mumbai ISKCON temple is displayed in below table. It is located in the big area and therefore it requires at least one to two hours for Darshan. It gets crowded in the evening and holidays including Saturday and Sunday. More time is required during the Aarti time. ISKCON mandir restaurant serves delicious vegetarian food to their devotees. Timings of the Govindas restaurant are shared below. 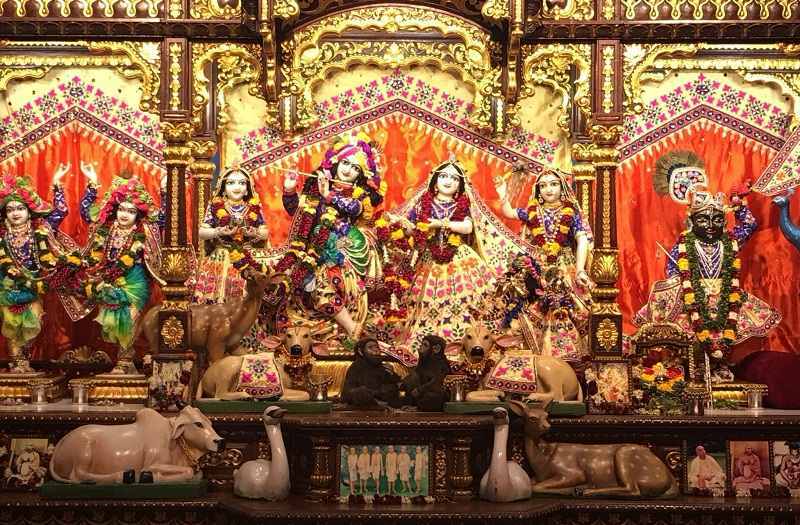 Sri Sri Radha Rasabihari ISKCON Temple attracts many tourists and here are the some information below which helps to plan last minute visit of this divine temple. Parking is big and parking facility is available here. It is a wheelchair accessible temple with wheelchair parking. Free shoe deposit counter and drinking water facility is available here. Govindas Restaurant and Bakery is situated inside the complex along with gift shop, book shop and library. Security is good and cooperative. Click pictures and Camera are not allowed inside the main temple. Beautiful sculptures are situated in the complex and beautiful paintings are depicted on the walls. Aarti is very divine here and devotees should attend aarti and kirtan of the temple. Janmashtami and Radhasthami are the main festivals which are celebrated here and thousand of devotees gathers here for these festivals. Other Hindu festivals are also celebrated here. Guest house and room booking can be done by visiting te official website of the ISKCON Temple Mumbai. Several multipurpose halls are also available in the premises to host birthday parties, weddings, conferences, and other celebrations. These are AC and Non AC halls can accommodate hundreds of people along with open terrace of capacity of 1000 to 1500 people. It is one of the most visited place of Mumbai along with Gateway of India and siddhivinayak mandir. Entry is completely free.